Dr. Michael Zak graduated from the Ferris State College of Optometry in 1983. He has been in private practice in the Clarkston area since 1990. He also practices at St. Joseph Mercy Brighton in the Clark Laser Eye Center. 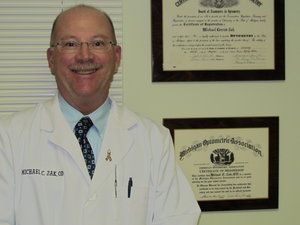 Dr. Zak is a past president of the Metropolitan Detroit Optometric Society, and has been a member of both the American and Michigan Optometric Associations for 33 years. An Independence Township resident since 1985, Dr. Zak and his wife Jan have three sons Christopher, Michael and Adam.